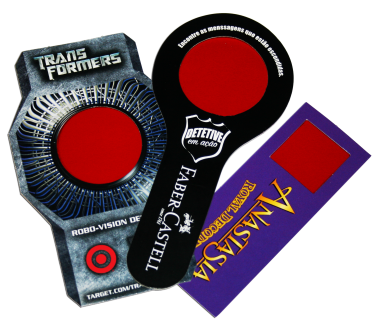 Unveil maximum advertising potential with Decoder Vision glasses and hidden message promotions. 3D Decoder glasses and viewers with red lenses bring out the detective in everyone by revealing secret messages and words. Make your next promotion play hide-and-seek and activate your x-ray vision using our Decoder glasses to expose hidden messages in specially printed promotions or for hidden messages on Web sites. WOW! It doesn't take a secret agent to discover that decoder glasses and viewers fit neatly in an envelope making them terrific for Internet sweepstakes, direct mail, promotional announcements, web site traffic builders, invitations, and grand openings! It is no mystery that 3D Decoder glasses are a highly effective, interactive tool to launch your next marketing campaign. Let our in-house graphic designer create hidden messages for your next print or Internet promotion.